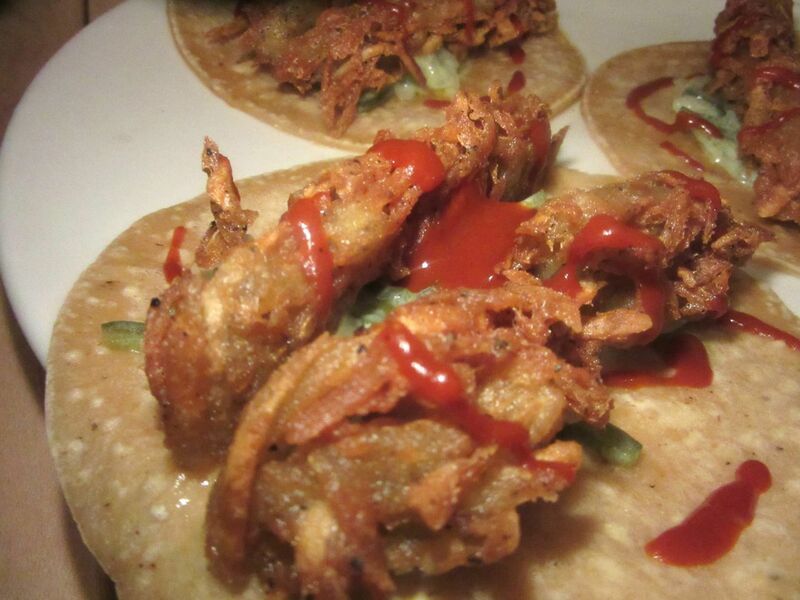 Empellón Tacos can be many splendored: falafel, octopus with peanut butter and fish tempura. Chef Alex Stupak had suggested that this 150-seat duplex on East 53rd Street was not meant to lure staid midtown folk with a humble statement like some of his successful ventures. He was clear. This would be his flagship, several notches above more modest efforts downtown. He calls it Empellón. We’re calling it Empellón Madison. The duplex is rich and complex with brightly painted art, animal sculpture, exposed kitchen, noisy bar. Stupak has made it a point that he considers midtown just another neighborhood and he’s looking for locals to fill the 150-seat duplex space that was designed for a restaurant but has stood empty since the building was completed in 2010. He’ll need them at lunch. 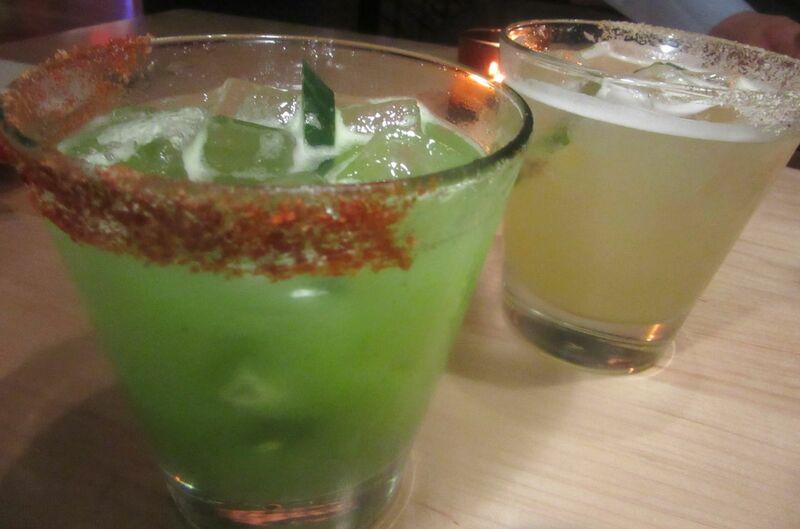 Among the $15 margaritas, saffron-infused tequila, mandarin orange and here, spicy cucumber, and pineapple. Two restaurants signed on before and then backed off. “It’s not an easy space,” Stupak points out. The buildout was challenging. It’s smaller than it looks on the main floor. Stairs to the balcony are steep (although there’s an elevator too). He has hired experienced backup, hung a collection of bright paintings on the wall, installed a zoology of animals on a shelf – “spirit animals” inspire him. Sticky rice tamales with red chile duck, $6 each, are not as spicy as expected. With so much speculative talk. I’m surprised to see tacos starring on the menu. 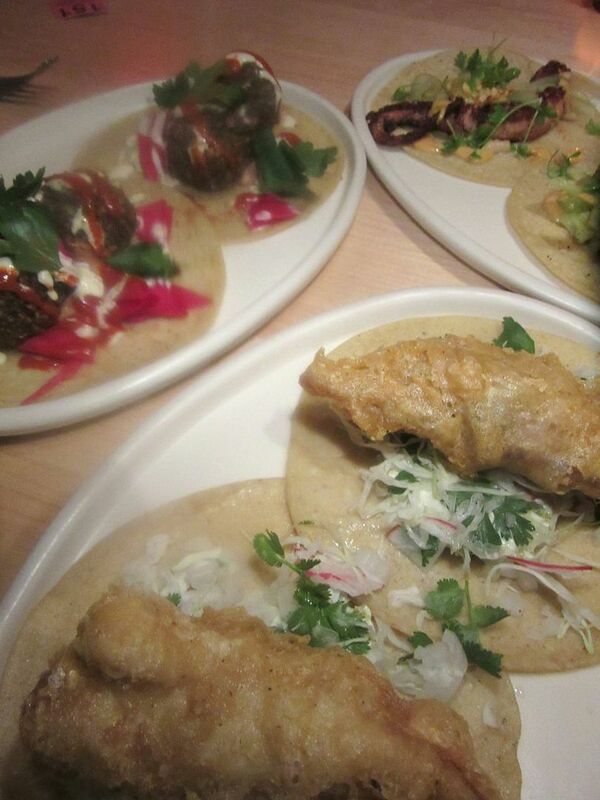 “We’re using tacos as a gateway drug to get people to try other stuff,” he told the Times’s Florence Fabricant. Does that seem contradictory? I’m not complaining. I’m always in the mood for tacos, especially these wild pitches. Stupak was defensive when he opened Empellón Cocina in 2012. He’d been the dessert chef at WD50. Now he proposed to cook savory. He wasn’t Mexican. He’d never worked in a Mexican restaurant. His food was esoteric and demanding. I’m guessing the giant snake painted on the wall of the bathroom was not meant as a tranquillizer. 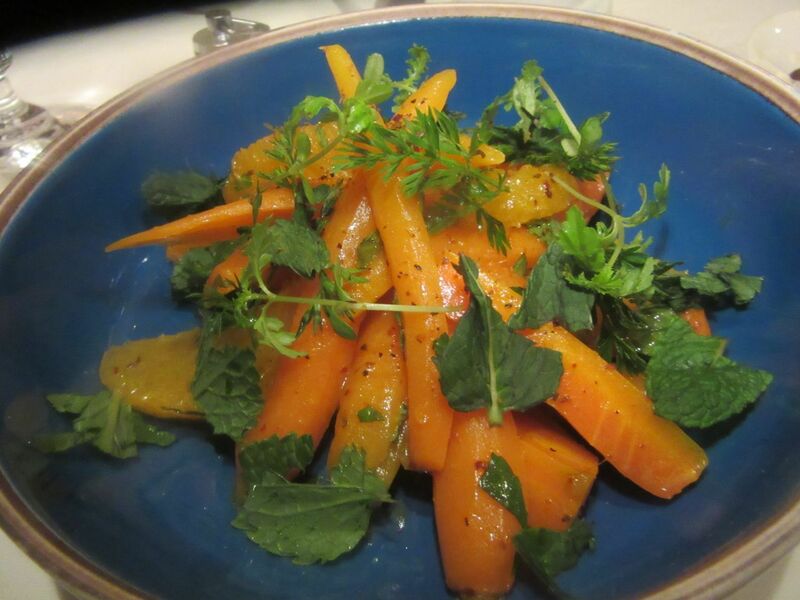 This is the wicked forest of carrots that won me at Empellón Cocina. The carrots looked wicked and forbidding, but they were remarkably delicious. I was knocked out by the shock of perfectly cooked shrimp and curls of masa crisps with sea urchin mousse. 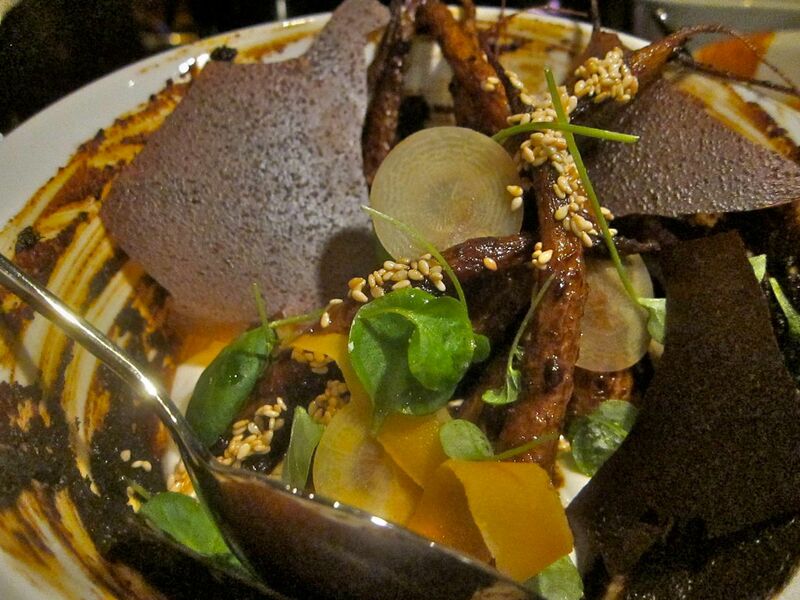 (Click here to read Smoke and Fire at Empellón Cocina). He proved he could dazzle the bourgeoisie with whatever collision he dreamed up. Check out the kitchen action through the sidewalk window on 53rd Street between Mad and Fifth Avenues. So, I was eager to taste what the chef would do for his doctorate degree. I arrive disgruntled. The address is 510 Madison but the place is nowhere on Madison. My cabdriver turns left at 53rd Street proposing to go around the block and look again. And there it is, in all its grandeur, on 53rd. I stop outside for a moment, to watch the kitchen action visible through glass from the sidewalk. I watch a cook slivering meat from a giant revolving haunch and am ready for…anything. 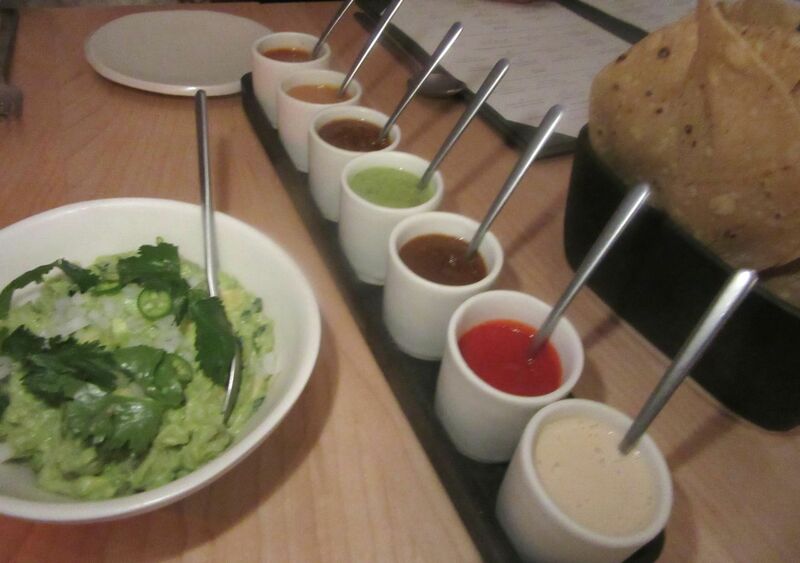 I love playing the seven salsas, testing to see how much I still love that heat. I’m with a friend of the house, parked in front of the kitchen that first evening. The noise is painful. Lauren across from me can hear what I say, but Wilfred to her left can’t hear a thing. She repeats everything I say for him. A $17 Bombay Sapphire martini and a $15 mezcal margarita smooth the edges of annoyance. And then the guacamole is a strong distraction. 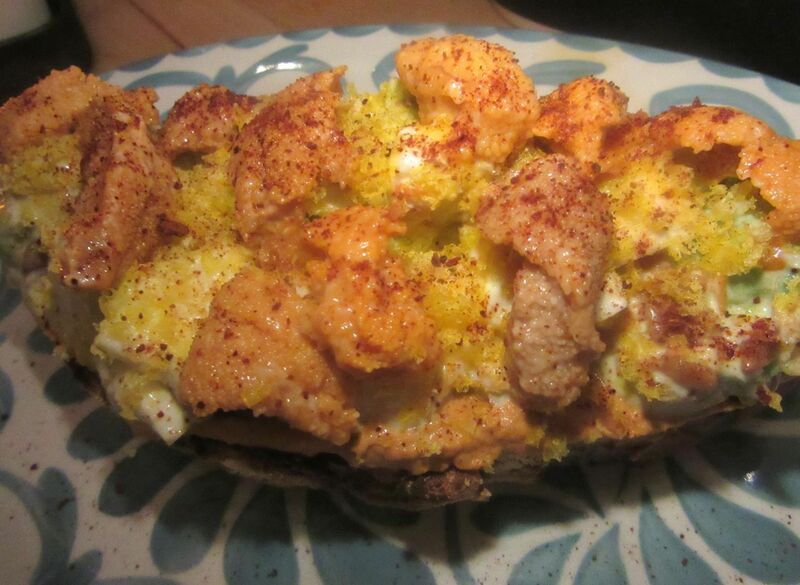 Avocado toast is child’s play compared to Chef Stupak’s sea urchin on egg white toast. It’s the chef’s unique guacamole with wife Lauren’s marvelous rough slab chips that I recall from downtown. There’s a small pudding of huitlachoche (corn fungus) too. I like the concept more than the taste. Planted alongside is a lineup of salsas in small pots. From mild to hot, there’s his smoked cashew, salsa roja, salsa verde, salsa borracha, tomatillo chipotle, salsa arbol, and salsa habanero. The color of Mexco’s flag and them some. I can’t say I like this Mexican fungus, but I’m not afraid of it either. So sock it to me anytime. I love this game. My pals are wary, but I keep playing the fiery end of the line, testing to see if my tongue can take the heat. “What did you say?” the waiter asks when I order. It’s too noisy for him, too. 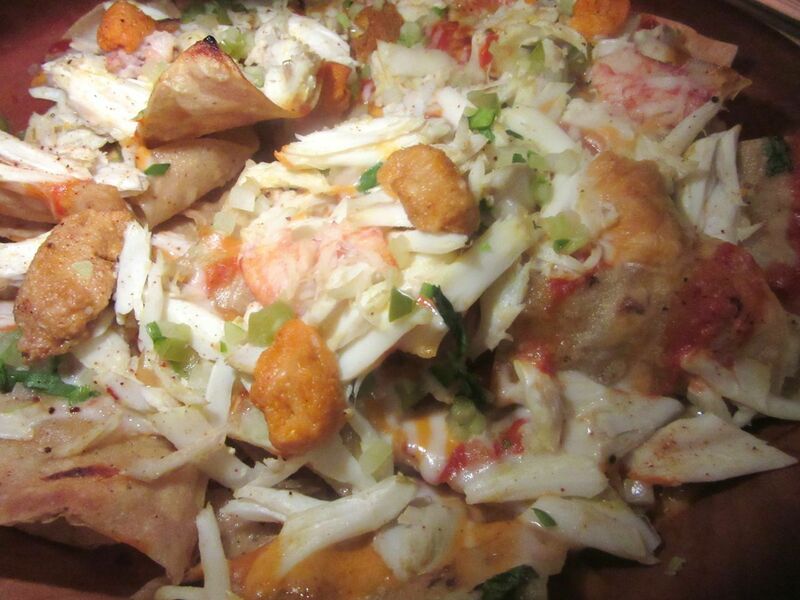 These crab nachos with sea urchin frosting are elegant and delicious. 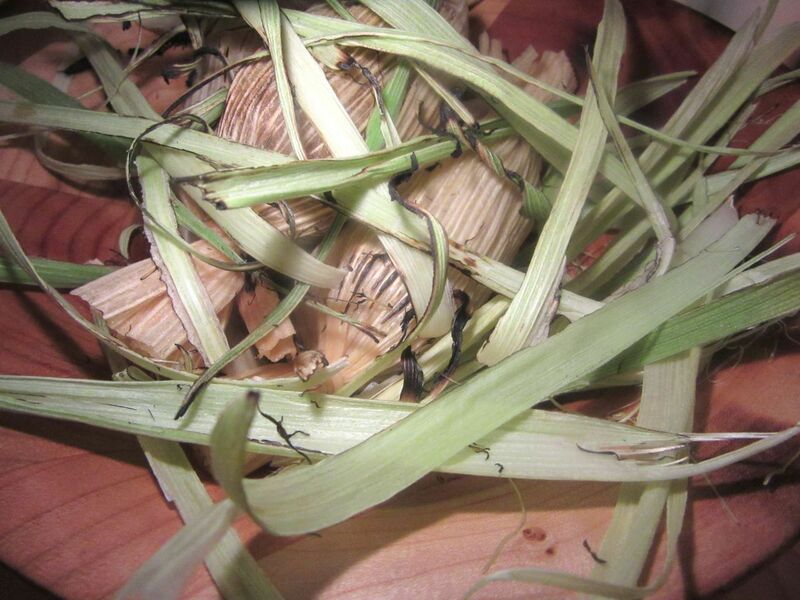 The trio of sticky rice duck tamales we’ve chosen is wreathed in straw. I’m not sure if duck with sticky rice is a step above corn masa. The nachos look like jewelry. The fresh, fat white petals of crab topped with sea urchin on aristocratic chips are addictive. I’m eating more than my share. Of course, we have to order the live scallop ceviche in a kalamansi lime puddle. I wait to see it breathe. 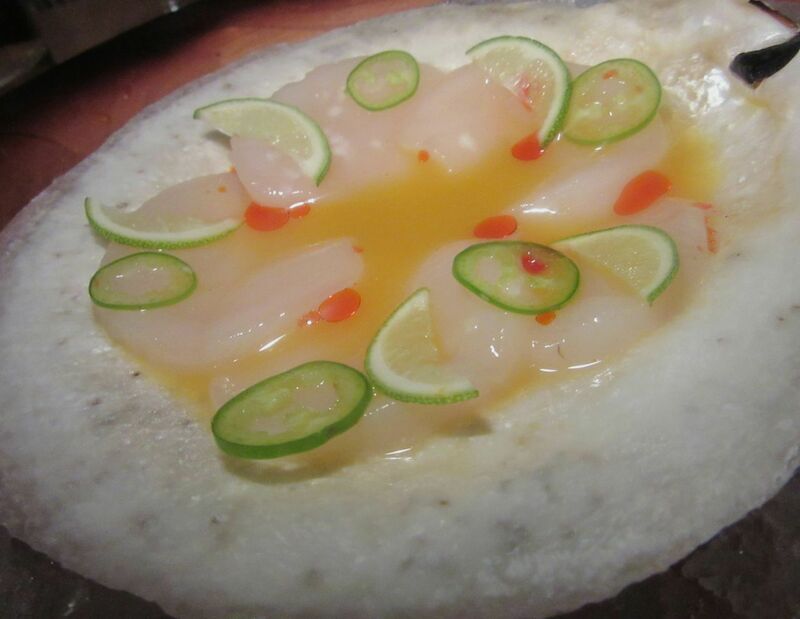 Runway-thin circles of “live scallop” ceviche float in a fragrant puddle of kalamansi lime leche. Of course, if there is more uni, we’ll have that too. Now the briny critters are clinging to chopped hard-boiled egg whites on thick country toast. A sublime invention. 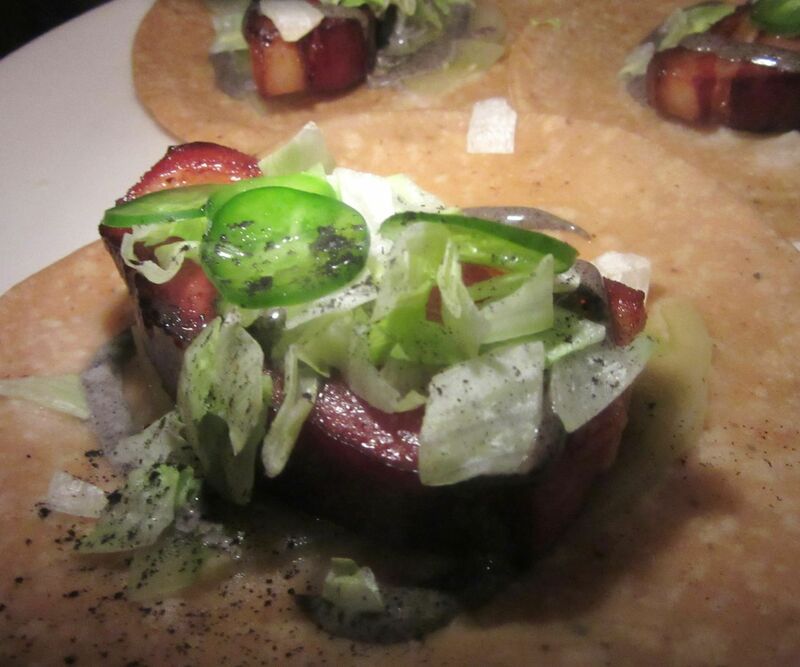 One day your cardiologist might say “go easy on the bacon.” Till then, go wild with these bacon tacos. At first glance, the menu seems brief, limited. But I’m regretting now what I didn’t order in my two early visits. Chopped cabbage salad with toasted fava bean dressing. 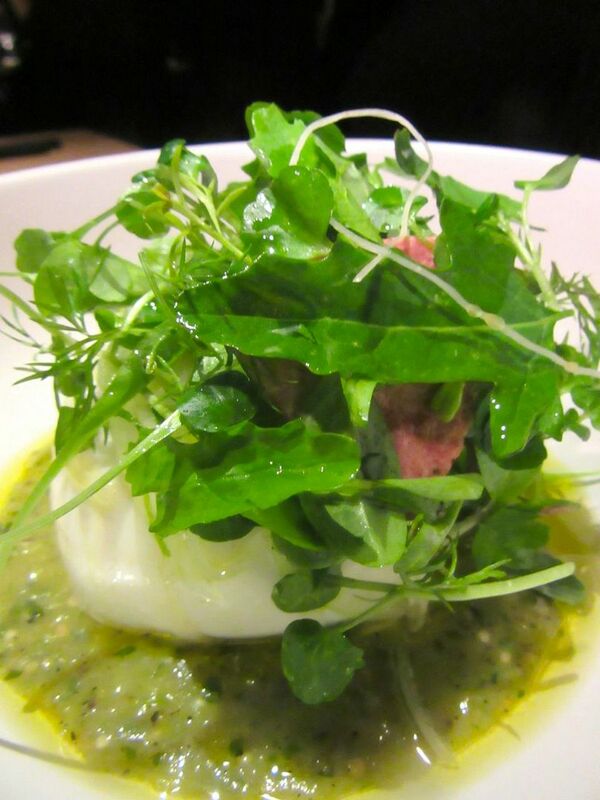 Lettuce leaves with salsa verde mousseline. Roasted prawns with chipotle. Short rib confit with picadillo. Some people hate lamb. Some hate sweetbreads. 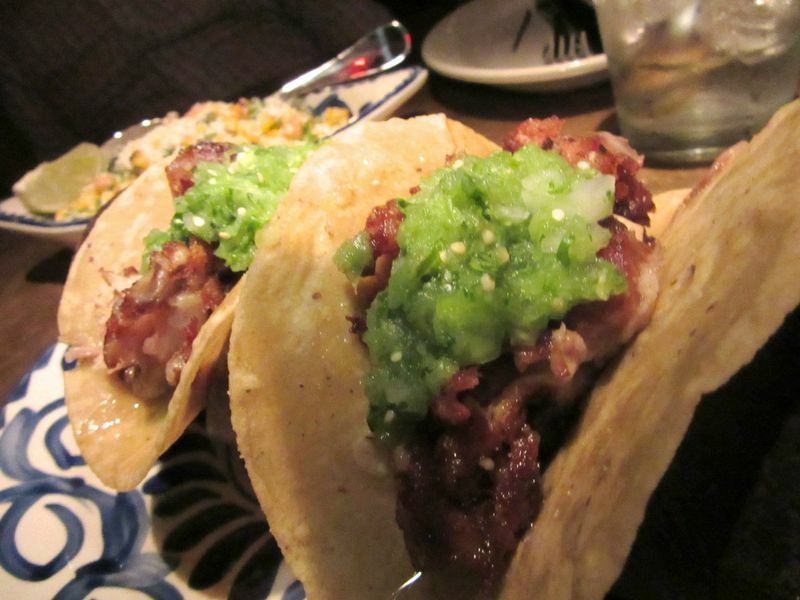 Some, like me, were waiting for these lamb sweetbread tacos. But tacos, as promised, demand exploration. They come two to an order so I have to ask for an extra to feed our trio. 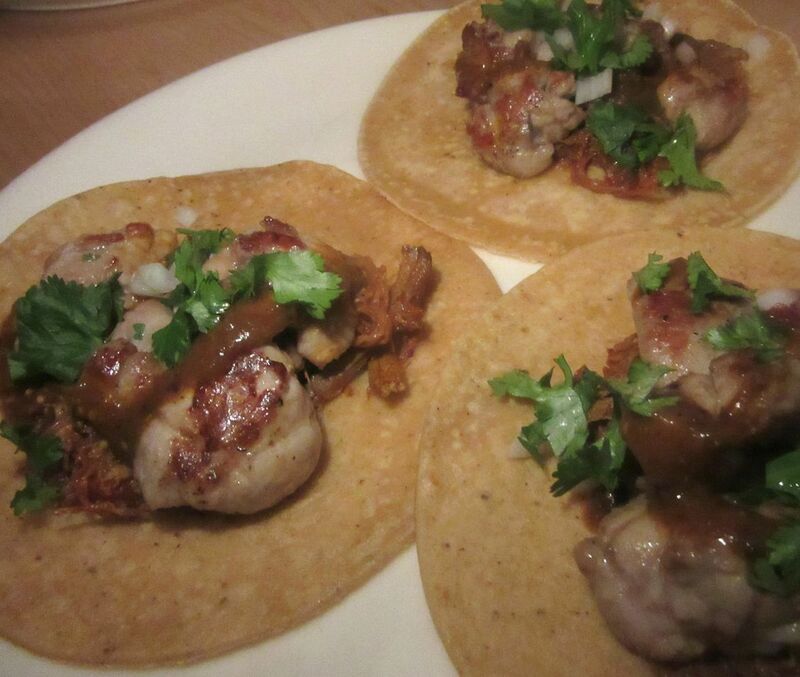 Lamb sweetbreads are luscious, big and creamy globes in barbacoa sauce with bits of raw onion and cilantro. Discover another reason why you can never get resist hash brown anything, including tacos. Thick-cut slices of caramelized bacon topped with pickled green tomato and crunches of lettuce is as rich as the sweetbreads. I wonder what a hash brown taco could be besides a necessary option for vegetarians. The answer is delicious clots of potato crunch streaked with tomatillo ketchup. I thought I didn’t need another cliché of octapus till I tasted the creature mated to peanut butter. “Yes,” is the answer. Grasshopper powder lends a je ne sais quoi protein to the hummus on the falafel taco. Of course, we’ll have it. And I can’t resist octopus with celery and peanut butter. Could anything be more in-your-face outrageous? What can I say? 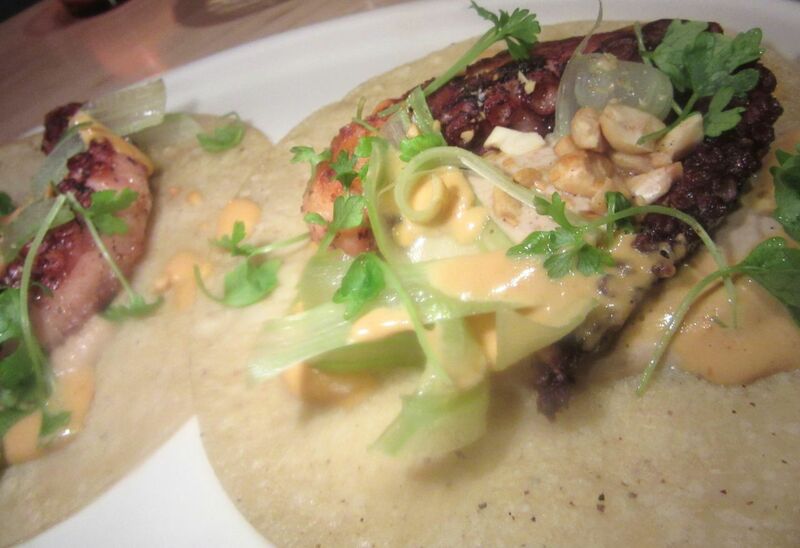 Believe it or not, octopus fans, this mollusk and peanut butter were meant to discover each other folded up in one of the house’s tweedy corn tacos. 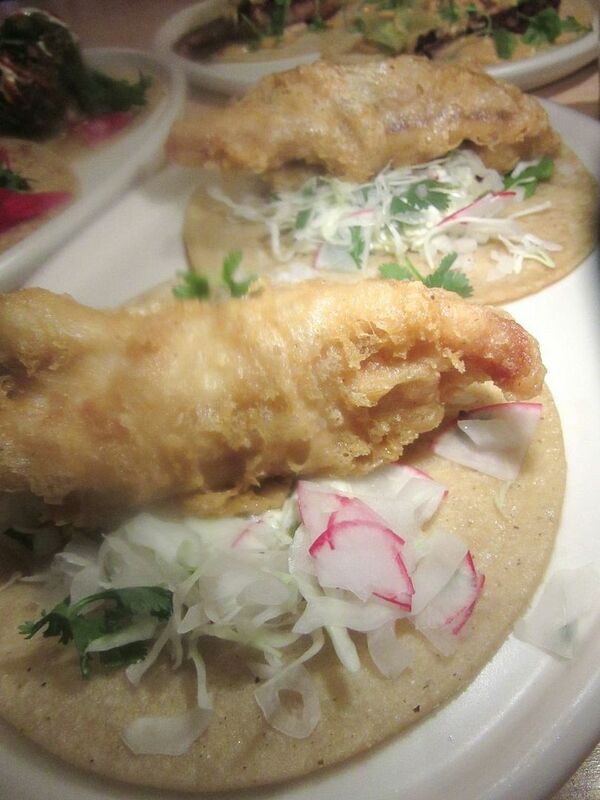 Fish tempura tacos may please the timid but these are too bland for me. The fish tempura on a thatch of salad with lime mayonnaise is definitely safer. That first night we had no appetite left for the “closers” (best shared, the menu advises). They range from fideo noodles with peas and cotija cheese at $29 to fajitas made with the rarest Japanese beef in black pepper mole for $125. 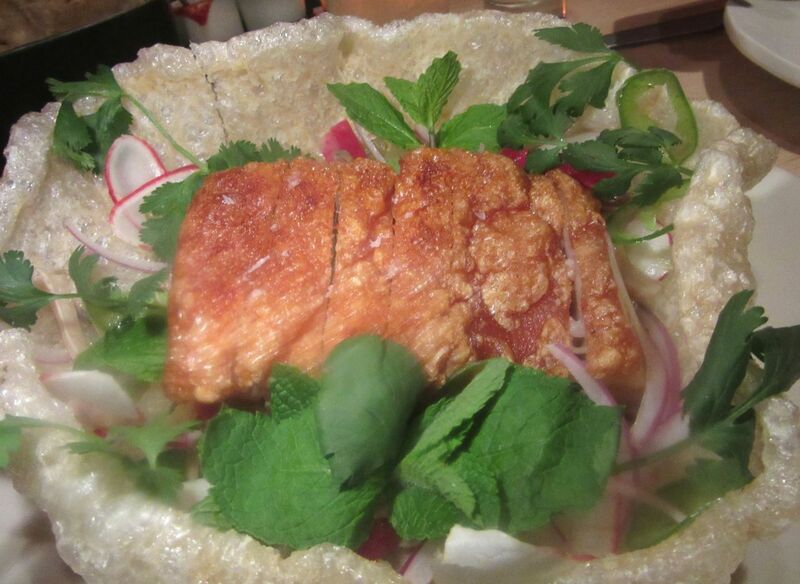 Pork belly in a pork rind “dish” is like a birthday party. The waiter slices, dices and pours. In that first outing we’d eaten too much to even try a closer. On my second visit I conspire to leave room. The three of us decide on pork belly. The waiter brings it to the table in a sweetly caramelized chunk with radish slivers and leaves of mint and cilantro in a fried chicharrón shell. He slices the meat first and the pork rind too, then pours on a sauce. Yes. We all agree. Good choice. 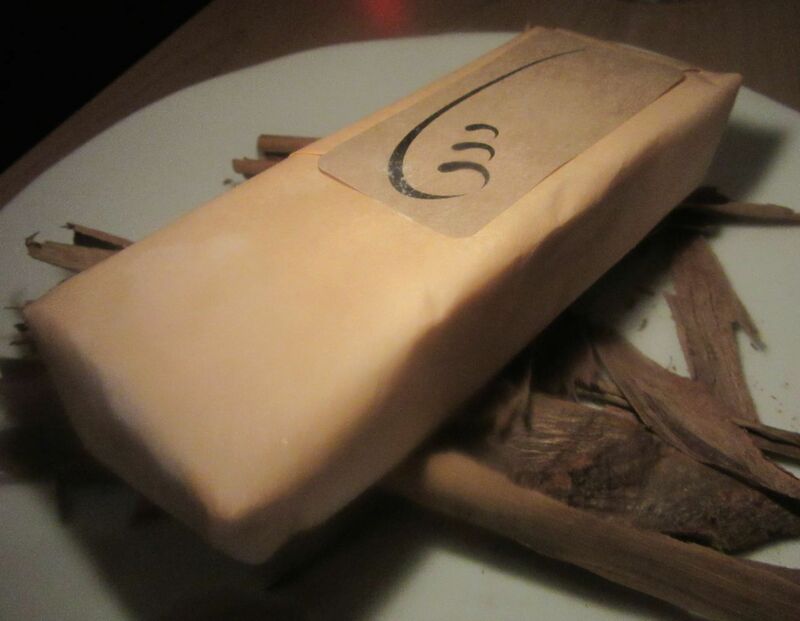 If nobody wants dessert but you, order the cinnamon ice cream sandwich ($6) and don’t share. Now, maybe one dessert. Earlier I’d tasted the canela ice cream sandwich, taken a bite of the corn ice cream taco delivered in a ceramic taco shell, and had two forkfuls of pineapple with cane sugar pilonchillo, bee pollen and chamomile ice cream. This avocado in transition is brilliant. Dare I say it is near-Fabergé? I’m sure flattery won’t work with Stupak. 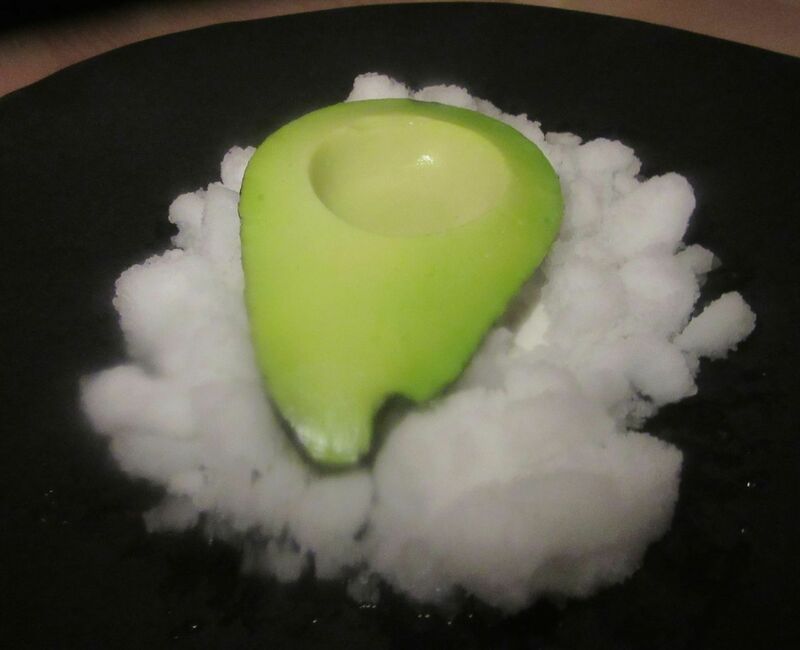 What looks like half an avocado on crushed ice is the dessert masterwork. 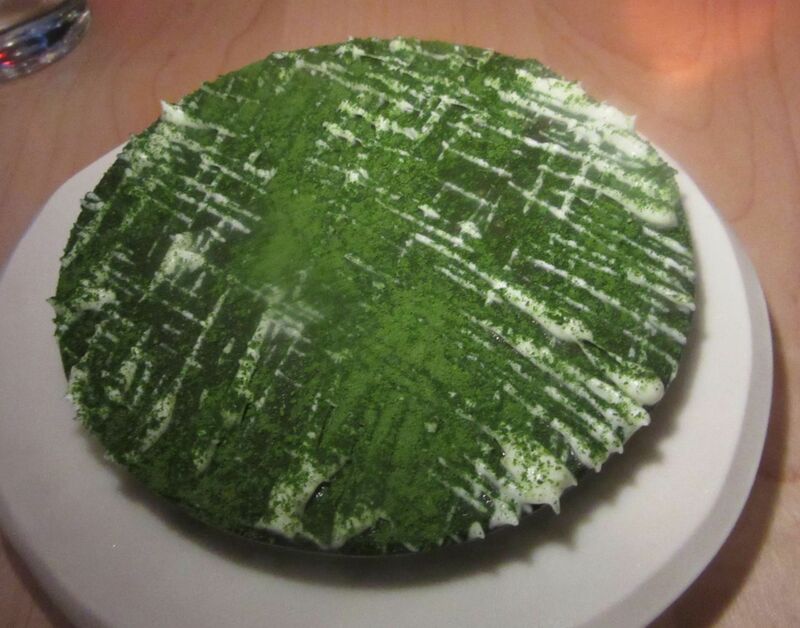 The fruit is a mousse and the “ice” is a trompe l’oeil of lime, olive oil and eucalyptus yogurt. Citrus for the table is highly original – cara cara orange with chile powder -- and just $7 per person. 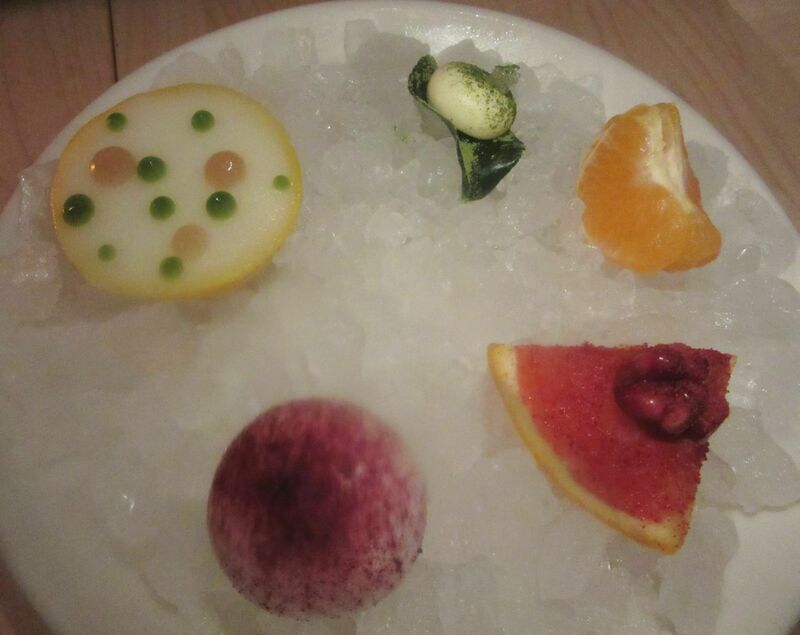 Citrus for the table is $7 per person: a tea party gathering of a rare kishu mandarin, meyer lemon sorbet with lemon balm, lime curd with finger lime cells, grapefruit-mezcal jelly with hibiscus marshmallow, and cara cara orange with chile powder and pomegranate. The chef has sent one to our frontline table. I taste everything. After sampling the avocado, my two more sensible companions seem paralyzed. I’m the only one exploring the farewell, mezcal-cured apricots in mocha. 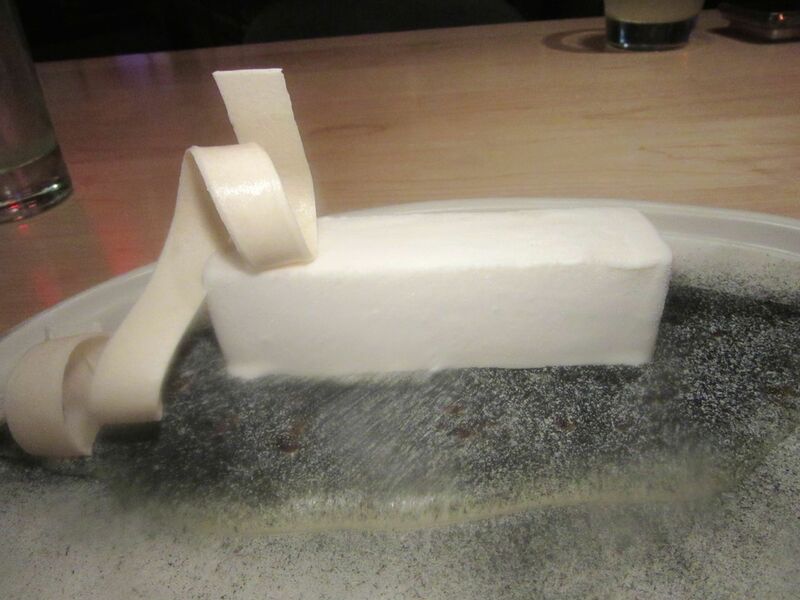 It looks like a wedge of banana pudding in soot, but it’s actually jasmine powder on caramel. 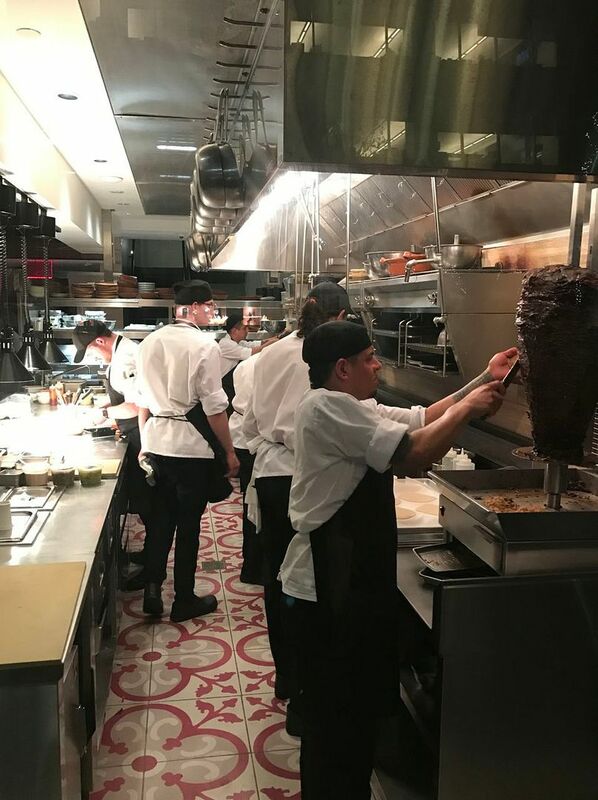 You could almost always spot Stupak cooking if you looked into the kitchen at Cocina. Now, he mostly stands outside the work zone, letting executive chef Colin King from Jose Andres’ Oyamel and Gramercy Tavern’s Duncan Grant monitor the flow. His wife and partner Lauren Resler is soon to have their second child. I watch as pretty little bloggers crowd in to say, who knows? I don’t read lips. Perhaps: How exciting! So wonderful. Well, it is. By the way, I usually check with the chef when I have questions, but Stupak refused to return my call. He did not appreciate my tweeting that the new place was painfully noisy. I also tweeted my pleasure in that early meal. Never mind. He took the pugnacious view. He has also rectified the problem with new sound-proofing, he emailed. 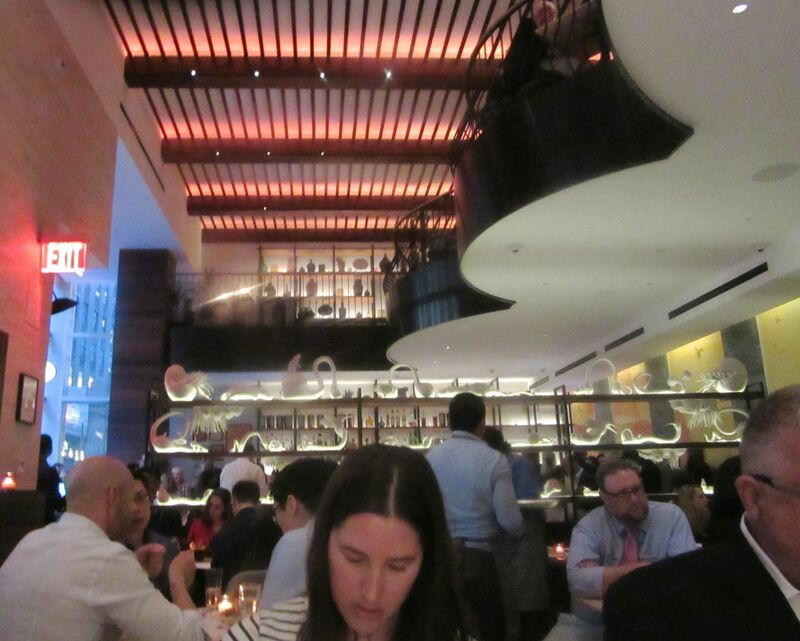 Here then, a first look at Empellón-Around-the-Corner-from -Madison. Shall I return? I’m not sure I dare. 510 Madison Avenue, entrance on 53rd Street between Madison and Fifth. 212 358 9365. Lunch everyday 11:45 am to 3 pm., dinner Sunday through Wednesday 5 pm to 10 pm, Thursday through Saturday till 10:30 pm.